Ursula’s been on a classic movie kick recently, her answer to spring sleet and cabin fever. I’m happy to be complicit. Over the past two weeks, we’ve watched all four melodramatic hours of Gone with the Wind and dallied with several light musicals. The old movie we’ve seen most recently: Mr. Smith Goes to Washington, released in 1939, the same year as Gone with the Wind. I’d seen Frank Capra’s movie a long time ago. I remembered Stewart’s character, Jefferson Smith, an idealistic young man from a western state who is unexpectedly named to fill a vacant seat in the U.S. Senate. What I hadn’t remembered was that before heading to Washington, young Jefferson Smith headed the “Boy Rangers,” an organization that audiences would have recognized as similar to the Boy Scouts (at that time itself a youthful organization of only 20 years). 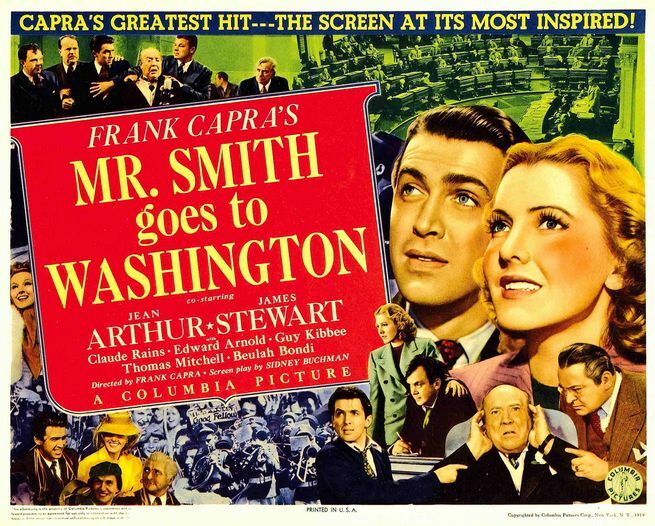 Smith’s winding path to the Senate begins when the governor’s four sons, Boy Rangers all, tell their father that “Jeff Smith” is the “biggest expert we got on wild game and animals and rocks” and the hero of the moment, because he and his Boy Rangers have just put out a huge forest fire. In 1939, the United States was still in the grip of the Depression, one of the longer and darker tunnels in American life, and was being drawn into a dark chapter of world history unfolding across the Atlantic. At the same time, a bitterly divided federal government pitted progressive New Deal crusaders on one side and corporations, capitalists, and citizens who feared the creep of Communism on the other. In the movie, the idealistic young senator discovers that a businessman who owns most of his state’s newspapers and radio stations — and most of its elected officials, too — has secretly worked out a graft scheme to build a dam in the very place that Smith has chosen for his boys’ camp. Framed and threatened with expulsion, Smith takes to the Senate floor to clear his name, while his Boy Rangers get the true story out at home. The movie was a box-office hit and made a star of James Stewart. Watching it with Ursula, I was struck by how contemporary its story line felt. (Except, Ursula reminded me, that now Mr. Smith would build a camp for boys and girls.) That got me wondering: Would today’s movie watchers make the same connection between building strong young bodies and creating active young citizens? How would a modern Mr. or Ms. Smith try to bring “the wonders of nature” to the country’s children? What do you think? Send me your ideas at greatkidsgreatoutdoors@gmail.com. I’ll collect them for a later post.